I played with power tools this weekend. Just two. But, one, in particular, got me totally excited. I may or may not have posted something about it on Facebook. One tool was a power miter saw. That wasn’t a big deal. I used to own one until I allowed some other people to use it and it came back to me in pieces. That’s a story for another day. Maybe. I’ve always wanted to use a nail gun. I can’t tell you how fun it was. It made quick work of assembling the birch branches. But, you can make a wreath like this without power tools. I know you want to make a wreath like this too. If you have a spare hour, you can put one together and hang it in time for your Christmas gathering. Thin birch branches. We found ours after a recent windstorm. Evergreen cuttings & Winterberry …fresh or faux. Florist wire to tie evergreen and berries to birch branches. Power Saw or hand saw to trim branches to size. Nail gun or hammer and long thin nails (E600 glue would also work) to assemble birch branches. Cut four branches to the desired length for the verticals and two shorter lengths for the horizontal branches. Lay your branches out in an appealing design. Using either a nail gun or hammer and nails or a power drill and screws or E600 adhesive…attach the birch branches together. Lay out your evergreens and berry twigs and cut them to size. Once your greens and berries are cut to size, discreetly wire them to the birch. The wreath was my contribution to this little vignette in the dining room at my friend’s home. She assembled and created the decor for the top and front of the wine rack. After she had completed this lovely display, I knew that a birch wreath would be the perfect complement. Here’s a view of the vignette at night. Now that you know how to create a birch wreath….will you give it a try? There is something really special about using these natural elements for Christmas decorating. I shared some of the symbolism of woodland elements for Christmas here. 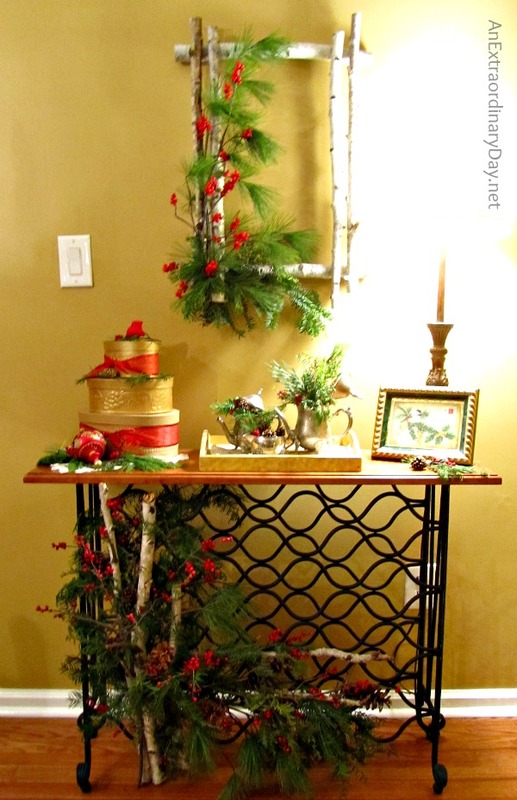 What kinds of natural elements do you like using for your Christmas decor? Do you love a natural look for your Christmas & winter decor? I did away with fb but I liked you to help u to 1000! Christmas Eve travels. And more big celebration after Christmas. Yes, my sweet friend, I keep you and Curt in my prayers. Praying that you have a joyful trip and celebrating Jesus’ birth and that you are able to leave fear in its place and you both experience wellness beyond anything you can imagine. I can’t tell you how much I love this and how sad I am I have no access to a Birch tree. I wonder if I can buy Birch sticks online. LOL I’m in Florida. All I have are palm trees, snakes and alligators. This is wonderful. I’m going to store it in the back of my creative brain and watch for some cool branches some where. This is so stunning. I love the rectangular shape you choose and how simple all the berries and evergreens are. Simply beautiful. I’d love for you to share at our Link It or Lump It party! I think your wreath is one of my very favorites of the season. Love the birch branches. I love that you didn’t cover the whole form with greenery, let the branches stand out for themselves. Now if I could find some birch branches somewhere. I’m thinking of ways to decorate the wreath without Christmas doodads on it so I could use it all winter anyway. Not too sure I’d want it on wall in spring and summer, guess would depend on what I put on it. Great project and sure glad you shared it with us all. I’m kinda late seeing some things as my pc decided to be hateful for couple weeks or so right around time I was heavy into getting ideas to make. Very pretty! Love that natural wreath for all year with some different greenery! Diane, I love your take on this Christmas wreath, just beautiful! Beautiful, rustic, and natural. Wish I had seen this post weeks ago, but I will keep it in mind for next year. Thank you so much Janet! I think it’s perfect for winter, too. This is so darn nice! Just loving the birch branches and am putting this in my Christmas 2014 ideas folder. Hi Lynnie… you are so sweet! I love the birch branches for winter too. I love this. Rustic, natural, and very unique. I really love the color of birch bark. Wish we had birch trees here in Texas. Thanks for sharing! Pinning! This is a great tutorial! Thank you for sharing the idea. I would love it if you would share this at Fresh-Cut Friday! I’m so glad you liked it, Liz!! Thank you for your original invite, too! Blessings! What a beautiful Christmas wreath! I love that it isn’t round. Can’t wait to make this. Thank you Michelle! I love that it isn’t round too! So fun!!! Hope you do make one, too! Very beautiful Christmas Decoration. I wish you a happy 2014 year. Thank you so much Ilena-carmen. You are so kind. This is so pretty! I may try to make something like this for wall decor for during the winter this season. Thank you for the inspiration! Stunning!!!! Thanks for sharing this tutorial!!! I. Love. THIS!!! I just pinned it on my Christmas ideas board! Linking from Fresh Cut Friday! Oh now that is so pretty! What a great idea! love it. I adore this idea and your whole display! I’m featuring you tonight at Knick of Time Tuesday – thanks for sharing at the party! I will be featuring this beauty tomorrow at our Link it or Lump it party. Be sure to stop by and grab a feature button! Oh, Betty, I’m so excited for you to be creating your own pretty wreath. Using Juniper tree roots is such a creative idea. I’d love to see a photo of it after you complete it. How dramatic it will be with your Ponderosa pine cones. We don’t have anything large like that in our area. Thanks for popping by with your kind words and sharing your ideas, too. All the best for an extraordinary week! !